NEW YORK -- Anyone thinking 2016 could be their year for that big jump in pay likely should temper any excitement. New numbers show employers are expected to reward employees with the same 3 percent increase in pay in 2016 that they received this year. For those looking for a silver lining, employers are expecting to give bigger pay raises -- 4.6 percent on average -- to their top performing workers, according to the numbers from consulting firm Towers Watson. %VIRTUAL-pullquote-To a large extent, 3 percent pay raises have become the new norm in corporate America.%"To a large extent, 3 percent pay raises have become the new norm in corporate America," said Sandra McLellan, North America practice leader at Towers Watson. "We really haven't seen variation from this level for many years." "While most organizations are finding the talent they need at current salary levels, we are seeing more employers prioritizing how their salary budgets are being spent, especially in light of their ongoing difficulty in attracting and retaining top performers or employees with critical skills," she added. The survey of more than 1,100 U.S. companies showed nearly 90 percent of employees at US companies are eligible to receive annual or short-term bonuses this year, up from 86 percent last year -- and 85 percent received a bonus this year, up from 81 percent in 2014. "Unfortunately, it's very rare to get more than a 3 percent annual increase within a company," said Angela Copeland, career coach at Copeland Coaching. "Companies see a higher employer turnover now than ever with people switching jobs every three to five years. They save their money to recruit new talent." Copeland and others, however, suggest there is a way to get that bigger salary increase one may be craving. "Hands down, the best way to significantly grow your salary over time is to be one of those people who consistently switches jobs every three to five years," Copeland said. "When you change companies, you are able to negotiate pay again from the beginning," she said. "But, don't take a low salary just to get your foot in the door -- expect 3 percent increases annually at your new job as well." Katie Donovan, a negotiation and equal pay consultant at her company Equal Pay Negotiations, agreed that, without a doubt, people get much bigger pay increases when they change jobs. She added with the cost to replace an employee so high, many employees -- even the average employee -- can use this to their benefit. For those looking to stay at their jobs, the numbers show it is by far the highest performing workers that see the biggest rewards, with an average salary increase 77 percent larger than the 2.6 percent increase given to workers receiving an average rating. Workers with below-average performance ratings bring up the rear, receiving a salary increase of less than 1 percent. 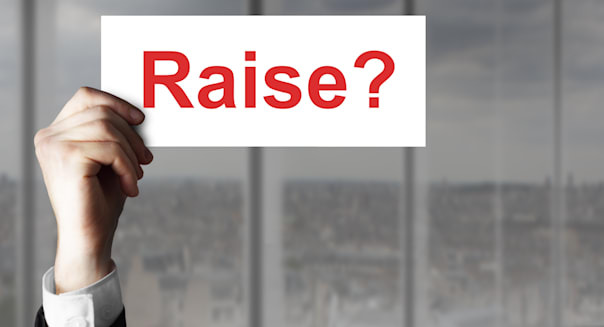 "Many organizations are rethinking whether linking base salary increases primarily to last year's performance makes sense or if this should be the role of short-term-incentive and bonus programs," McLellan said. Regardless of how a company gives out salary increases, Donovan said now is the time to negotiate next year's pay raise. "Budgets for next year tend not to be finalized yet, so there is opportunity," said Donovan. "Do the research, and see what the pay is for your job in your area. Then talk to your boss about being underpaid and show the data. ""Do not make any statements about leaving," she reminds. "But ask, 'Well, if you had to hire a new person -- based on this data -- it looks as though you would need to pay them more than I'm making. I'm just looking to earn that amount.' "